his collection of Japanese folk plays reveals a previously unknown and decidedly unaristocratic element to Japanese theater. Interspersed between the stately, slower paced dramas of Japan’s Noh theater are the delightful comic plays or interludes known as Kyogen. These brief plays evolved from the bawdy skits that were rousingly enjoyed by the plebeian populaces of the cities in feudal Japan some hundreds of years ago when Noh itself was a pastime and entertainment exclusively reserved for the aristocracy. Today they still provide delightful relief from the sustained and concentrated action of the Noh play that has changed very little throughout the centuries. Among the various forms of classical Japanese drama, the flamboyant action and brilliant coloring Kabuki has perhaps enabled it to be the most easily understood; and the Noh, in a number of excellent translations, has become widely known for its poetic beauty. But the Kyogen, equally deserving of attention, have remained relatively unknown. 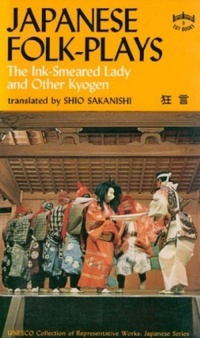 Only now, with this new edition of Miss Sakanishi's excellent translations, are they at last readily available to the Western reader.